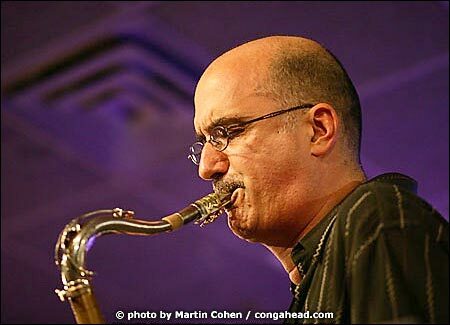 Michael Brecker and his band recently gave a dynamic performance to promote their new CD, Wide Angles, at New York City's popular Iridium jazz club. Band members included Gil Goldstein on keyboard; LP® artists, Daniel Sadownick and Antonio Sanchez on percussion; Larry Grenadier on bass, Robin Eubanks on trumpet; Adam Rogers on guitar; and David Eggar on cello. Michael is one of his generation's most celebrated tenor saxophonists whose technical abilities and imaginative command of his instrument have made him a desired session player for the past thirty years. The nine-time Grammy award winner's innovative, passionate style can be heard on his numerous solo recordings as well as on the over 800 jazz, pop, and rock albums he has contributed to over the years. To learn more about Michael Brecker, visit MichaelBrecker.com.